North Shore Pediatric Dental and Orthodontics is expanding its services to include orthodontics for both children and adults. Dr. Audra Reynoso will practice out of 900 Cummings Center, Suite 119-W, located across the hall from North Shore Pediatric Dental’s primary location at 116-T.
Dr. Reynoso is a native of Massachusetts, having grown up on the North Shore in nearby Lynnfield. She received her undergraduate degree from Tufts University, in Medford, and then earned her Doctor of Dental Medicine degree and her Certificate in Orthodontics from Tufts University School of Dental Medicine, in Boston. 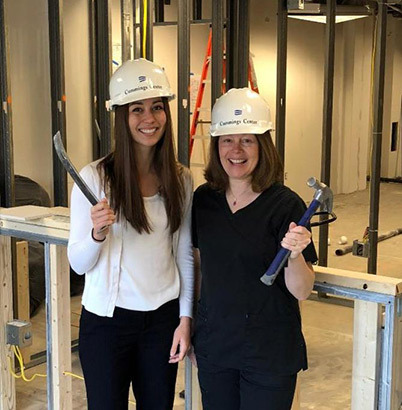 Dr. Audra Reynoso (left) and Dr. Lisa Campanella (right) are expanding their practice to include new services and a new Cummings Center office space. Founded by Dr. Lisa Campanella – or Dr. Lisa, as her patients call her – North Shore Pediatric Dental and Orthodontics has experienced significant growth since its founding at Cummings Center in 2005. With the addition of Dr. Reynoso, the practice now has nine full-time and five part-time staff. Cummings Properties’ portfolio of 11 million square feet of prime space accommodates offices, healthcare facilities, labs, restaurants, retail storefronts, warehouses, co-working spaces, executive suites, and more. With a portfolio of this size and variety, the firm can meet almost any commercial real estate need from 150 square feet to 300,000 square feet. Its in-house experts in design, construction, and property management offer “one-stop shopping” first-class service for the business community.